ellie etc: WISHLIST | Hello January, Hello 2014! 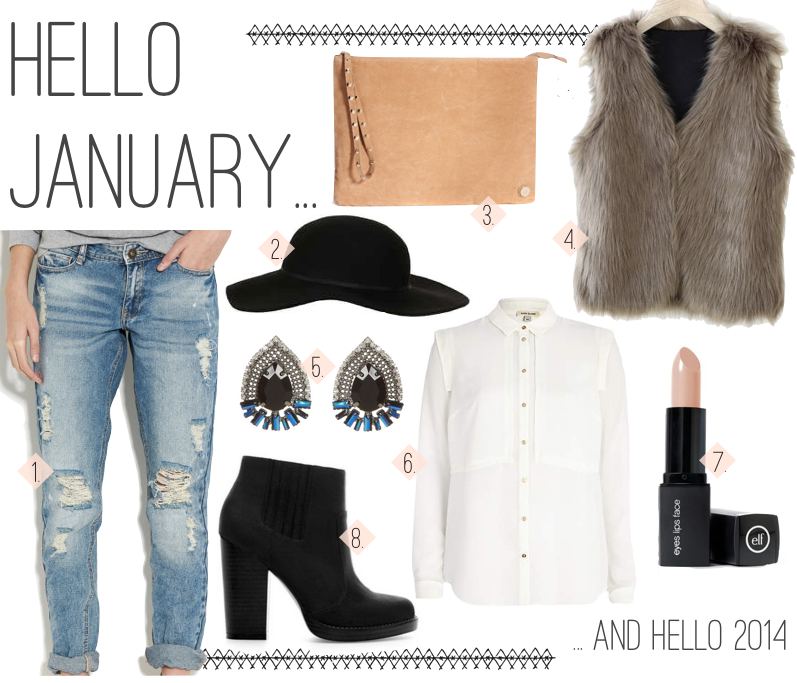 WISHLIST | Hello January, Hello 2014! Hello my darlings, Happy New Year to you all! Where on earth did 2013 go?! I'm certain it went by quicker than any other year has done. I hope you all had a lovely Christmas and fabulous New Years! It's a week into 2014 already, and already my bank account is suffering and my eyes/heart have locked onto too many things I can't afford (and also, being completely honest, don't really need). So as my first post of the year (eeeek that's so exciting!) I thought I'd show you lovelies what's on my January wishlist. I feel like some of these choices are channelling Millie Mac's incredible fashion sense, as well as feeling pretty mature.. New year new me and all that maybe? The ripped/boyfriend jeans have been on my radar for a while now, I'm not sure if I'll be able to pull them off but I really want to try. Also on my radar has been a fur gilet. For too too long I've kept my eye out for one, so it's just my luck that when I have very little money I manage to spot the perfect one! At the ripe old age of 18 (haha, funny joke I know), I feel I need to start dressing a tad more sophisticated. So I think it's about time I owned a white shirt - that isn't school uniform mind. Just about everything I've ever read about 'classic style' states a white shirt is an essential. I think this simple River Island beauty would be a perfect timeless addition to my wardrobe. I've been after a floppy hat like this one for a while too. Not sure if I would ever dare wear it out so possibly not the best thing to invest my money in. And what girl could turn down a bit of make up or some pretty jewels? Especially for such good prices as those at e.l.f. and New Look - hence those additions to my wishlist. I've managed to grow quite a clutch collection over the past few months. I think the neutral tone of this one makes it perfect for the day time, which is just what my collection is lacking. Finally, the beauties that are these black Zara boots! Like my mum, you may be thinking 'wow Ellie, don't you have about a thousand pairs of black boots already?!'. The answer to that question is yes, slight exaggeration, but yes I do have many a pair of black boots. However none with a heel the height of these, making them perfect for a casual night out. And looking like these, how can they not be on my wishlist?! In other news, I am so unbelievably excited for this year! I've already got several holidays and a festival planned, I'll be leaving college in the summer and I should be (fingers crossed) off to Uni in September. Too much to look forward to! What have you got planned for 2014? Any pretty things on your 2014 wishlist? Or even anything on your 2014 bought-list? p.s. if you still haven't checked out my new SHOP MY WARDROBE section click over on the sidebar, below my picture, or at the bottom of each post. I will be updating it as often as I can as there are still lots and lots of things to put up! !